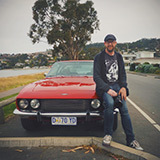 How many known Jensen Interceptors are there in Tassie? Are there any other mk1s? About 9 that I can think of including some that have been laid up for a long time and an early mk1 (Vignale like yours) that is a wreck. By my count, there are 15 other Jensens in TAS ... soon to be 16. There are 3 Mk1's ... Adams + 2 Mathina cars (although one of the cars is a rusted, incomplete suitable only for limited spares). None of the Mk1's in Tasmania are Vignale built. Vignale built the first 60 or so Interceptors before the complete production and tooling was shipped to the UK. The last car believed to be Vignale built was #115/2570. Aren't the vignale cars the ones without the vent behind the c-pillar badge, or did some english cars have that as well? And what is the 16th? The J-H in pieces near Sarge's place. That is 13. What have I missed? The Vignale cars do have the closed C-Pillar ... but so do the early English cars. The Vignale cars have a whole let of extra features not found on later production cars. I will feature a lot of this stuff in the future in the JChats. Stay tuned. The J-H in pieces near Sarge's place - Can I have a photo and a chassis no. please as I know of the existence of this car ... but have no idea which one it is? 1954 Early Interceptor - seen around Hobart. Owner not known. Blue Mk3 Interceptor - formerly owned by Alan Belle from University of Launceston. I believe the car is still there ... somewhere! another Jensen on it's way down under (I do believe). I heard the 54 had left. Think an Belles us gone too but I may be wrong. More info on #16 please.